A dreamy arrangement of pink and white flowers in a glass vase. 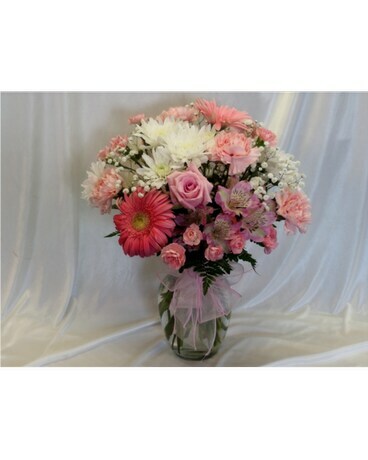 Pink carnations and roses, gerbera, alstroemeria, daisy and cushion mums, babies breath and mini carnations arranged in a vase with a pink sheer bow. Each arrangement is individually created by our designers. The flowers used will vary.